I know that this post is late, I'm sorry! I had to give a presentation yesterday, in Norwegian. It was quite scary. In a few days I have to take an exam, so I might be a little late with my posts and comments, but I am doing my very best and looking forward to sitting with a great big cup of tea and reading all of your wonderful posts! PS: The Norwegian "Ø" is pronounced kind of like "ur" as in "further". Nøkken is the Norwegian name for a certain type of water spirit. 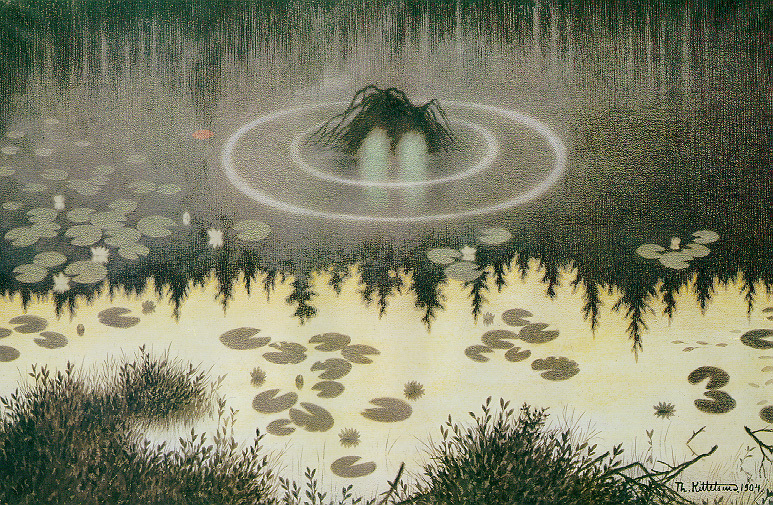 This water spirit is otherwise known as the 'näck' in Swedish and 'nykr' in Old Icelandic. I believe the nøkken is known as the ‘nix’ in English. The nøkken was able to shapeshift but is more commonly known as a male water spirit, who played an enchanted violin in order to lure women and children to their deaths, in either a lake or stream. This happened most commonly at Christmas or Midsommar’s eve, and among the most vulnerable to this creature were pregnant women and children who had not yet been baptized. To this day, the waterlily is known in Scandinavian language as the ‘nix-rose’. The nøkken will become unhappy if he does not have access to water. There are tales of one water spirit who went to live with a human after they had fallen in love, but was unable to stay, due to the deep yearning to return to the water. It is not easy to describe the appearance of this creature, due to his tendency to shapeshift, however he is often depicted as a rather elegant man, playing the violin, sometimes in a waterfall. 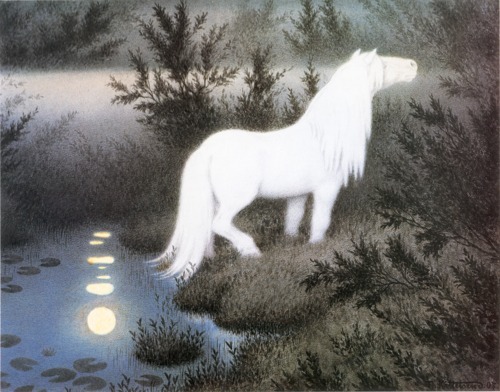 He can also be depicted as a brook horse. Between this creature and the Huldra, have I frightened you enough about swimming in Scandinavian lakes? Luckily it is said that the nøkken will teach you to play beautiful music if you bribe him with a little animal blood or some Brennivín and if you are attacked, the nøkken will die immediately upon hearing his name. Have you heard of this creature before? Do you have a favourite folktale or creature, that is found in your culture? I’d love to hear what sort of stories you have in your country! Russian literature is filled with folk tales. My favorites are The Little Magic Horse, The Firebird, and Baba Yaga, a witch who lived in the forest in a house with chicken legs and ate little children. In Spanish/Mexican literature there is La LLorona, a sad woman who killed herself and her baby because her lover would not marry her. www.lallorona.com has her story. Good luck on the exam. There are many stories around water. It's fluidity and depth give it beauty and mystery. It is such an integral part of life, yet can be so dangerous and bring death. Water can be misleading - looking refreshing and is something you need, but can be poisonous or full of disease or harmful creatures. Fiction based on water, lakes or oceans are just as wide and imaginative as outer space. How interesting! I've never heard of this spirit before. My fave folktale/creature in the USA is, by far, the legend of Sasquatch. I had so hoped to see one when I was living in the Pacific Northwest. Fascinating tale/legend. Maybe those stories were invented to keep kids away from dangerous waters or to explain certain tragedies. I'm loving learning about Norwegian legends and folk tales! So interesting! I love reading about these folk tale's creatures. My grandma used to say that there was an angel who came to give our family a hand at occasions like weddings etc, when it was hard for us to cope with a lot of work. I love the folklore. In Louisiana we have rougarou which takes on different forms depending on the storyteller. Scary stuff! But fun.